Last modified on November 13th, 2014 by Joe. Show current location on map using Google Maps API. 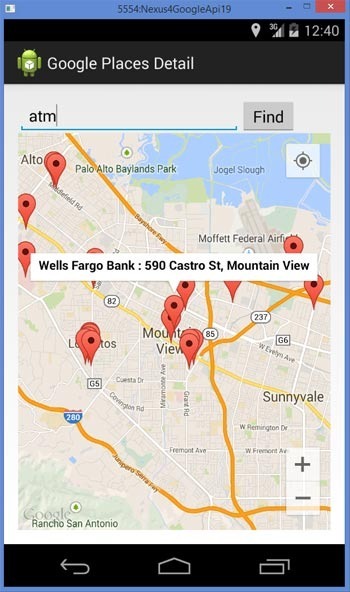 Find places Nearby using Google Place API. Google Places API is one among the many APIs provided by Google and this is to get geographic information about places using HTTP request. We need to pass the latitude and longitude coordinates of the location to know about the location. To authenticate with the Google Places API, we need to get a API key. The type of key is “Server Key”. The steps are common for all the APIs. You should login to the Google API console and create a server key. You can refer the previous linked tutorial to for more detail. The following example application first gets the current location and shows the Google map accordingly. Then based on user input the type of geographic location that needs to find is done. Example for keywords to find using the Google Places API are atm, hospital, airport, bank, etc. Google Play Services is required for Google Maps and Google Places. If you are using Android Studio and Gradle, you should have the following dependencies added in build.grade file. Note the following permissions to be given for the app. The API_KEY specified here in the manifest is for Google Maps. The API key specified here is for the Google Places API access and it’s a server key. We are using LocationListener to get the current location and show in Google maps. Using the location received, we get the latitude and longitude and the form the Google Places API request http url. We use an AsyncTask to run the the request in background. It runs in a separate thread and requests the Google server for the Google Places information. Then we use another AsyncTask to parse the HTTP result json object and show the places in Google map. Comments on "Find Places Nearby in Google Maps using Google Places API–Android App"
Plz update me we new code or correct code ….. I incorporated the code and nothing happened. Please tell me how to get the contact number of near by police stations, By using place api I am getting the address, lat lng and other details about police station but this api is not returning the contact number. Same Problem Here… Everything works fine except after clicking find button it shows nothing.. Plz if anyone found the solution about this then plz post it & sir plz help us about this problem.. It works perfectly fine, use your own API key and not the one provided, also make sure you use the Browser API key for google places as opposed to the Android API key. Make sure Google Maps API v2, Places API and Google Maps Engine API is turned on in your developers console. Thanks a million, great tutorial! I got server key, how do i get browser api key. When i click on find app crashes. Hello. I have enabled all the APIs and made sure my API keys are changed in both locations. But, when I press the button it still won’t find anything. Any tips? which key i generate for android app..
how to find blood banks? I have followed your tutorial but whenever i click on the button the app crashes and i am not able to understand where i went wrong. Great Tutorial! But I think I miss something as others… when I press the find button nothing happens… Any sugestions? I use my own API key. Android Key and Browser key. but it still show nothing. can u help me, please. @dewigim, can you check the trace and post the errors you get? I run the application on device. it shows my location. but when I click find button, it doesn’t show the markers, I tried string “hospital”. there is no error. I think the problem is key. neither browser key nor server key worked. Para todos los que dicen “no pasa nada al pulsar el boton Find” el problema seguramente sea que habeis puesto solamente un API KEY, se necesitan dos API KEY diferentes, en GooglePlacesActivity.java teneis que poner el API KEY del navegador no de android. sir if i want include extra like routes how can includes routes code???? when i use android key showing not authorised api key with empty reference.when i user browser key plaease enable services in developer.api android please help me. But one issue is that where is the activity_google_places layout file .. i cannot able to find it. Comments are closed for "Find Places Nearby in Google Maps using Google Places API–Android App".